Harvard Forest in Petersham, Mass., is a National Science Foundation Long-Term Ecological Research site. Credit: Photo by David R. Foster. One helpful action anyone can take in response to global warming is to plant trees and preserve forests. Trees and plants capture carbon dioxide during photosynthesis, thereby removing the most abundant greenhouse gas from the atmosphere and storing some of it in their woody tissue. Yet global warming may affect the capacity of trees to store carbon by altering forest nitrogen cycling, concludes a study led by Jerry Melillo, Distinguished Scientist at the Marine Biological Laboratory (MBL) Ecosystems Center, and published this week in Proceedings of the National Academy of Sciences. The paper summarizes the results of a 7-year study at Harvard Forest in central Massachusetts, in which a section of the forest (about one-quarter of an acre) was artificially warmed about 9oF above ambient, to simulate the amount of climate warming that might be observed by the end of the century without aggressive actions to control greenhouse gas emissions from fossil-fuel burning and deforestation. The study confirmed, as others have, that a warmer climate causes more rapid decomposition of the organic matter in soil, leading to an increase in carbon dioxide being released to the atmosphere. 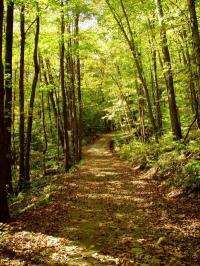 But the study also showed, for the first time in a field experiment, that warmer temperatures stimulate the gain of carbon stored in trees as woody tissue, partially offsetting the soil carbon loss to the atmosphere. The carbon gains in trees, the scientists found, is due to more nitrogen being made available to the trees with warmer soil. "Tree growth in many of the forests in the United States is limited by the lack of nitrogen," Melillo says. "We found that warming causes nitrogen compounds locked up in soil organic matter to be released as inorganic forms of nitrogen such as ammonium, a common form of nitrogen found in garden fertilizer. When trees take up this inorganic nitrogen, they grow faster and store more carbon." Melillo says that the biological processes that link soil warming, increased soil organic matter decay, increased nitrogen availability to trees, and increased tree growth will likely operate together in many temperate and boreal forestsforests found in North America, Europe, Eurasia and much of the developed world. Tree growth in tropical forests is often limited by factors other than nitrogen, so lessons from this new study are not widely relevant in the tropics. While Melillo thinks that the carbon-nitrogen interactions he is studying at Harvard Forest will help us to make predictions of carbon storage in forest over the coming decades, he adds that "the carbon balance of forest ecosystems in a changing climate will also depend on other factors that will change over the century, such as water availability, the effects of increased temperature on both plant photosynthesis and aboveground plant respiration, and the atmospheric concentration of carbon dioxide." But the study also showed, for the first time in a field experiment, that warmer temperatures stimulate the gain of carbon stored in trees as woody tissue, partially offsetting the soil carbon loss to the atmosphere. Point 1 is a temporary "con," because there is only a limited amount of material to decompose, while point 2 is a permanent "pro," since it means the living plants will grow faster and larger, taking up more CO2. I'm a bit annoyed, because once again, the headline presents this phenomenon as though it were a bad thing, when in fact it is a good thing. This is yet another aspect of plant biology which functions as a planetary self-regulation mechanism, in that accelerated CO2 uptake in plant mass means global warming produces positive feedback in plant growth. However, accelerated plant growth produces negative feedback in any global warming. Thus, the warmer it becomes then the faster plants will grow, and the faster plants grow, the less CO2 can accumulate in the atmosphere. Once the plants are growing faster and faster, then they will quickly deplete the CO2 from the atmosphere, ending any alleged greenhouse effect. "a warmer climate causes more rapid decomposition of the organic matter in soil, leading to an increase in carbon dioxide being released to the atmosphere." So ... all the extra CO2 could be caused by natural warming rather than the other way around? Over the SHORT term there is emission of CO2. Over the LONG term, plants will just eat it up, just as they always have. I think I should clarify. The radius of a Nitrogen atom is 130 pm. That is PICO meter. One TRILLIONTH of a meter. 1 E-12 Do you know how small that is? Carbon's atomic radius is 140 pm. It is BIGGER. Have you ever seen balloons going up? The smaller ones get by the bigger ones and go up FASTER. The nitrogen is leaving the soil faster anyway so it doesn't matter that the soil is losing Nitrogen. What matters is that LONG term plants will eat up the BIGGER radii carbon atoms because they can't get away cause the smaller ones are pushing them down. Just use Archimedes principle. You actually managed to make me laugh that time. Nice try. Only that 3.5E18kg of Nitrogen in the atmosphere isn't going anywhere. Equilibrium? Bigger plants: more matter decomposing. Too bad the study doesn't show the loss of organic compounds from soil by extraction and combustion. All life is self sustaining organisms. Creatures of sustenance. Trees (and other flora) and humans (and other fauna) are comprised of organic compounds that are being stolen from the ground and wastefully combusted. By extracting oil and such from wells in saturated ground we leave the ground less saturated and less fertile. Pumping oil dries the earth of nutrients, organic compounds required for life to flourish. No flora no fauna. There are far more dangerous repercussions to fossil fuel burning than variance in temperature through climate change. Without the biosludge biological creatures of sustenance cannot be sustained. Taxation is not going far enough. We need new technology to replace this caveman energy deriving system before it is too late to change the deevolutionary course we've set life on. Life took a long long time to evolve into what it is, "borrowing" the basic building blocks and combusting them is dangerous for lifes very existence. The author ignored the fact that the earth has been cooling since 1998 and will cool for another 17 years before warming for 30 years as it has for hundreds of years. He also ignored the fact that for the last 600 million years CO2 increases about 800 years after the earth warms, not before. And, not only does soil warming cause the release of CO2 but also so does ocean warming and oceans cover 2/3 of the earth. You are not addressing the temperature threshold between different plant species made be a tree could with stand large variance in temperature that we come to experience but what about wheat and corn the life blood of are civilization. If are crops are late even one season the effects on the human population would be devastating.